“I am invisible!” the baby American Robin seemed to think as it sat, unmoving, next to the coils of the garden hose. I had heard the little fellow cheeping loudly and also its parents alarm cries from inside the house, so I went out to investigate. Fledglings leave their nests, often before they can fly, hiding in shrubbery or tall grasses . If you find one of these little fellows and it is fully feathered, please leave it where it is. The parents will still care for their young one. 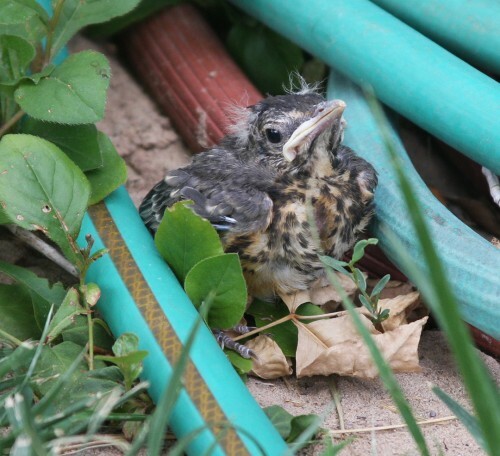 Many well-intentioned people gather up the little birds thinking they are orphans, essentially bird-napping the fledgling and rushing it to a wildlife rehabilitator. It is best to leave the young birds alone and let their parents do their job!